Non governmental, not profitable volunteer organisation, which in its 78 years of action, has fostered 15.000 kids, with the aid of 3.000 volunteers. Every summer, the camp offers a home and psychosocial support to all kids, irrespective of their origin, nationality, religion, gender, age, family and financial status. All the activities are organised and put into practice exclusively by the -more than 80 active- volunteers, while in no sector are people employed. To host for free, 140 children at the camp, money is raised from events, while a substantial part of the costs is covered by sponsorship-offers of money or products, which friends or companies provide. During the rest of the year, inspirational, creative workshops and recreational activities are organised by the volunteers, for children from institutions, earthquake victims, refugees or kids who live in degraded or isolated areas. Apart from actions for kids, volunteer training seminars are organised, youth exchanges, mountaineering and trips by the volunteers, while there are also Editorial and Drama groups. Last but not least, continuous systematic work is done by volunteers for the enhancement and maintenance of the facilities and equipment of the camp on Pateras mountain. 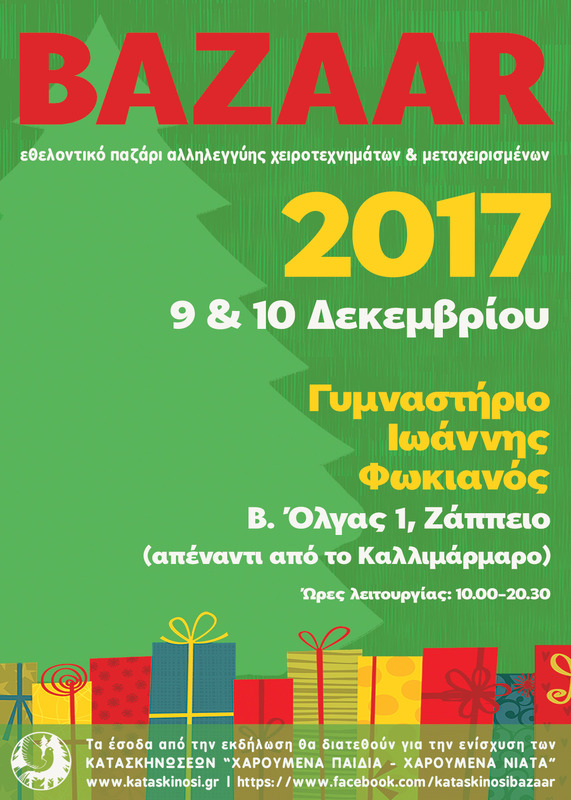 The volunteers of “Summer Camps Happy children-Happy youth” are organizing, for the 7th consecutive year, the annual “Solidarity Christmas Bazaar”….